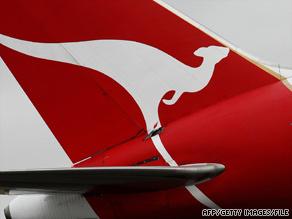 The Qantas Group on Wednesday announced that its annual profit tumbled 87 percent. Australia’s largest air carrier reports its full year pre-tax profits fell to US$150 million The carrier — which operates its flagship Qantas as well as discount airline Jetstar — says its bottom line was hit by falling demand for air travel during the global recession. Qantas Chief Executive Officer Alan Joyce, said the diversity of the company’s operations had contributed to its being one of the few airline operators worldwide to produce a full-year profit, despite the global economic downturn, according to a company statement. “There has never been a more volatile and challenging time for the world’s aviation industry. When most airlines are reporting losses, the Qantas Group is reporting a profit for the full-year,” said Joyce in a release. To maintain liquidity, the company implemented a number of measures in the past year, including a deferral of US $7.9 billion of capital expenditures with aircraft makers Boeing and Airbus. Citigroup’s Surprising Profit: Are Banks Really Out of the Woods?